IBM and SAP share a vision for responding to customers' specific requirements for tighter integration, platform flexibility, lower total cost of ownership, and improved performance. DB2 UDB V8.2.2 is an SAP-optimized version that uses autonomic computing technologies specifically tuned to help SAP users streamline installation, improve performance, and increase availability. 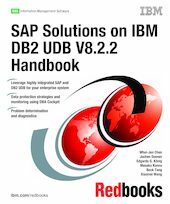 This IBM Redbooks publication provides information for SAP consultants and SAP system administrators. It includes the latest DB2 UDB architecture details, SAP-related features and functions, practical advice on SAP NetWeaver 2004 installations, and DB2 configuration in SAP environments. We describe DB2 UDB’s logical and physical database objects, storage management, SAPs data classes, and space reclamation strategies, and provide the best practices for intelligent storage subsystems. We also discuss how to use DBA Cockpit to monitor your system, DB2 UDB log file management, database backup and recovery, and high availability and clustered solutions. We introduce the Problem Description / Problem Source Identification (PD/PSI) methodology, and the troubleshooting approaches for common problems. Finally, we include a discussion of the new features of SAP NetWeaver 2004s Business Intelligence (SAP BI) with DB2 UDB V8.2.2.